What’s packed inside your carry on for a long flight is so important. For starters, you’re stuck with whatever you have on you for the next couple of hours and trust me you want to be as comfortable as possible if you’re on a flight for hours on end. I feel like Mary Poppins when I travel because I pull a million things out of my backpack. 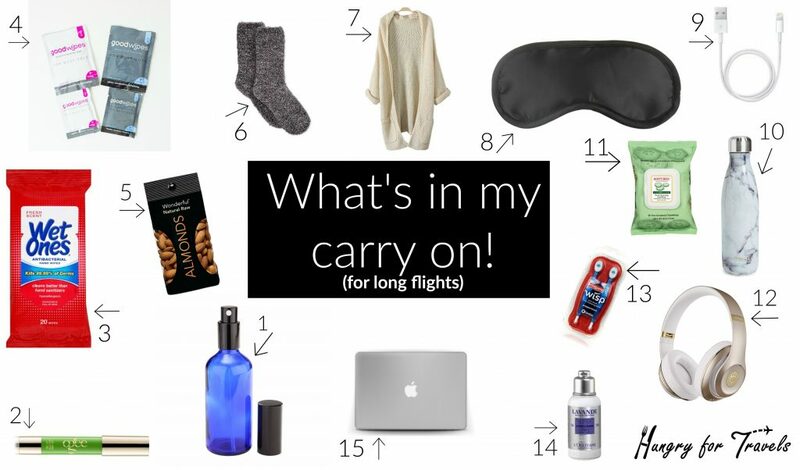 Here’s a list of my top things that are always a must in my carry on! Lip balm. Make sure you keep those kissers lubed up the entire time. Don’t want to land in a new destination with dry, cracked lips. My favorite: Ogee Sculpted Lip Oil. Antibacterial wipes. Before I was the seasoned traveler as I am now I never thought to bring these and literally got sick after every trip. Now that I know how many gross germs are on planes I always keep these in my bag and wipe down EVERYTHING before I get comfortable. I’m talking seatbelt, arm rests, trays, and tv screens and I’m proud to say I haven’t gotten sick one time since I started doing this (knock on wood). Deodorizing body wipes. Sounds weird but it’s like a shower in an individually wrapped packet. Before landing it’s nice to feel refreshed and wipe off all that nasty recycled air that has been circulating in the airplane for the past several hours before sticking to you. My go-to: Goodwipes. Healthy snacks. Sure, they feed you on long flights. Is it good quality food? Unless you’re in fancy first class, not really. I like to pack a few snacks that fill me up that isn’t the lukewarm rubbery chicken breast or overcooked pasta option. Raw almonds are always my go-to. Fuzzy socks. As the plane is taking off so are my uncomfortable shoes. I like to slip into something a little more comfortable… like obnoxiously fuzzy socks. A sweater. No matter where I’m traveling to a sweater is always a must in my carry on. I was on my flight to Dubai from the US but it felt like I was flying to Antarctica with how cold it was on my plane. You can never rely on the thin airplane blankets to keep you warm and cozy during those long hauls so it’s always smart to pack a sweater in case. Eye mask. A good quality eye mask is crucial for long flights. A lot of times the airplanes won’t dim their lights for hours on end and how is a girl supposed to get some quality beauty sleep when it’s light as day in there?! Answer: black out eye mask. Phone/computer charger. Want to know a terrifying feeling? Landing into a foreign country with a dead phone and not knowing where the hell you’re going. Always keep a charger handy just in case AND an adapter that will work in the country you’re heading to. Never know. Water. So so so SOO important to keep hydrated while flying. Being dehydrated automatically makes you feel more jetlagged and just plain terrible. I drink a ton of water while flying and I always like bringing my own refillable bottle for them to fill up. My favorite: S’Well Bottles. Face cleansing towels. On long flights I like to get in the zone the same way I do before I go to bed… and that’s take off any face makeup I might be wearing. It tricks my mind into thinking it’s time to sleep even though it’s only 6 pm my time at home and I’m not in a bed. Noise canceling headphones. The best way to arrive into a new destination is feeling well rested. I don’t know about you but I have a hard time sleeping when all I can hear are babies crying and people crunching on snacks. I love drowning out all of the noise by putting on soothing music with my noise canceling headphones. My favorite: Bose. Disposable toothbrush. Always a must. Once I get on the plane and get comfortable I go and brush my teeth before it’s time to go to sleep and then I always brush them before I land! Helps to wake me up and get me going. Lotion. Just like it’s important to drink water to stay hydrated you also want to keep your skin hydrated! I love bringing a little bottle of lotion with me and put it on before taking off. Makeup. I don’t sit there on the runway and paint my face or anything but it’s amazing what a little face makeup, swipe of mascara, and a touch of lip gloss will do for a gal’s confidence. Passport. 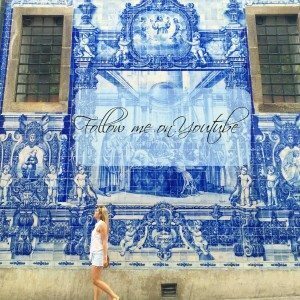 Obviously only if you’re visiting a foreign country you will need this. Also, I always make sure that I have a photo copy of my passport (just in case) and the name and address of where I am staying. Most countries when you go through customs ask you for the name and address of the hotel you are staying and it will help expedite the process if you are prepared! Mints. Because, bad breath is bad.